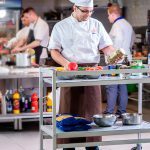 The INTARSPLIT split system line covers the 5 most common commercial refrigeration applications from cutting and preparation halls to positive and negative cooling rooms up to 400m3. Total control of production and numerous factory inspections ensure optimum operating reliability. 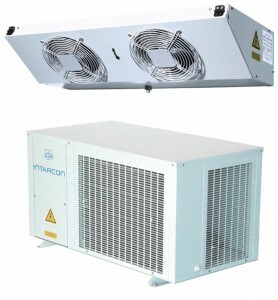 – Double-flow unit cooler: rooms at +8 °C / DT 10K. The fin spacing and defrost methods are different for each application. • The condensing unit is housed for outdoor installation. Three compressor technologies are available: hermetic pistons, semihermetic pistons and Scroll. Each compressor is equipped with an oil sight glass, case heating element, suction and delivery valves. • LP regulation and HP safety are provided by factory-set pressure switches. • The vertical condenser is equipped with 1 to 4 fans depending on the model with different rotation speeds to suit various environmental conditions. • As standard, condensing pressure regulation is provided with variation of the fan speed or with the pressure switches depending on the model. • The liquid receiver is equipped with an outlet valve to isolate the liquid line composed of a filter drier cartridge, a sight glass and a manual shut-off valve. • The electrical enclosure is incorporated into the casing and the main circuit-breaker is protected in a case to avoid any damage during transport. • The unit is pre-charged with R407A refrigerant. • Units are available in low noise configuration. expansion device and solenoid valve. For further details, consult our commercial evaporators brochure. • Defrost control (air or electric). • Display and transfer of alarms. • All units can have XWEB option Remote Monitoring. • Built-in forced operation for fast cooling or freezing. Designed to meet the needs of a wide range of commercial industrial cooling applications, the INTARSPLIT condensing unit line comprises capacities from 5 to 75 kW. These totally enclosed units are installed outdoors either on the ground or on the roof.The INTARSPLIT line offers a solution to noise problems (down to 39 dBA at 10 m with the low noise level option), and may be used under extreme outdoor temperature conditions. • Painted sheet metal chassis with enamelled sheet metal casing. Installed outdoors on the ground or roof. • Semi-hermetic reciprocating (7.5 to 50 HP) with suction and delivery valves, crankcase heater and head cooling fan for negative applications. • Standard H5-H6 or H9 Standard with tube end protection casing. • With service and safety valves. • Includes of a filter drier cartridge, sight glass and a shutoff valve. • Assured by a HP pressure switch cartridge, an auto LP pressure switch, HP regulation and oil differential pressure switches. • Electrical enclosure: sealed, with circuit-breaker on the side and “power on” light indicator. Outputs and unit protection devices. Designed to accommodate as many cooling outputs as required. • The enclosure is closed with a 1/4-turn screw. Possibility to latch the door open during service. Contact Us for more details on the range of refrigeration package systems we can offer.